One of the best ways that government can support small businesses is buying from them. With significant attention focused on increasing SME spend in central government, the Centre for Entrepreneurs and Spend Network have partnered to explore the other side of this debate: local authority procurement. Although central government has an explicit strategy to do more business with small firms, the same cannot be said for the UK’s local authorities, and thus performance varies widely. 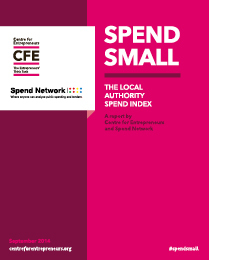 Spend Small: The Local Authority Spend Index presents a comprehensive, nationwide analysis of the state of spending with small businesses by local government over the past three years: the first of its kind undertaken. Whereas most reports examining procurement rely on surveys and self-report data, this report draws its conclusions from analysis of government spending data: over 44 million transactions drawn from 158 local authorities.